called Tropical Fruit. Love this set!!!! 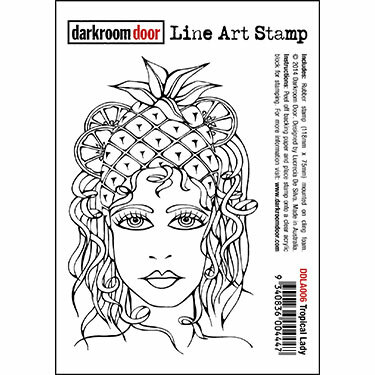 Stamp Tropical Lady (treating it like a background stamp) on white cardstock . I used brown ink. Trim to 5" X 5". Shade edges with brown ink. Mat on brown pattern paper. Punch out corners, shade with brown ink and adhere to the left top corner.of card front Stamp the Pineapple and Lemon on white cardstock using yellow ink for the bottom of the Pineapple and the Lemon. Cut them out. Shade the top of the Pineapple and around the Lemon with green ink. Adhere to card front. 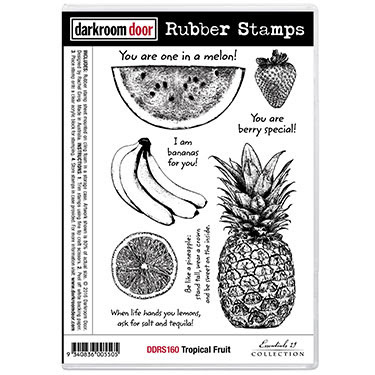 Stamp out sentiment on white cardstock and mat it to green cardstock. Adhere to middle of Pineapple image. Add twine. Speckle with brown ink or similar product. what a cool card. diggin' the pineapples. love it. Beautiful! 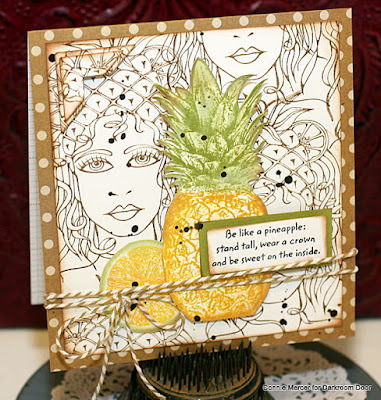 Love the splash of yellow on the pineapple! I'm sorry if I sound like I have nothing original to comment. I am simply wow-wed every time I see one of your projects. Gotta love the food stamps! You could create coloring books Connie!